It takes a special person to see the beauty that can be held within a drawing on a person’s body. That is the vision that an inspired tattoo artist has. Of course, it is important to the artist that they have the best quality materials to work with in order to provide the best looking work. The E-onsale Deluxe Tattoo Kit is one of those machines that can appeal the experienced artist as well as someone new to the art that seek for beginner tattoo kits. What is Inside this Kit? The E-onsale Deluxe Tattoo Kits comes with several different features that can please all those interested in tattooing. The kit comes with two guns that can be used for tattooing. It comes with a power source, inks and needles. The kit also has a CD used for tutoring those just beginning to enter the tattoo world. The kit is shipped in an aluminum case that is designed to be used for carrying your supplies. It comes with a lock and two keys for added security. In overall, great tattoo equipment package. Now, let’s talk more about each device in the tattoo kit set. The E-onsale Deluxe Tattoo Kit comes with two tattoo machine guns. They are ten layer warp coil machine guns that are wrapped in a snake leather pattern. The guns are not as heavy as one would expect, they are light and easy to hold for long periods of time when using them. You will also receive two grips with rods. The grips come in chrome and a black color. Along with the guns, you will receive eight tips; size 3R, 5R, 5M, 7M, will come in both an alloy round tip and the alloy magnum tip. 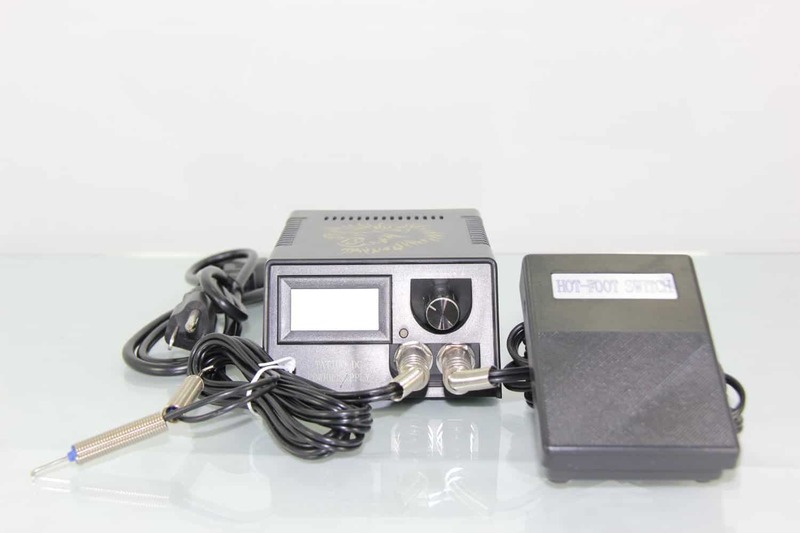 The power supply in the E-onsale Deluxe Tattoo Kit comes with a foot control switch. The UL listed digital power supply has the ability to operate at 110V or 220V. This allows the artist to gain an output between 2Vdc and 20Vdc. The power cord is made with a silicone insulated cord that is high quality. The power supply is reliable and offers great smooth quality with the foot petal than many of the more expensive models. It’s important to note that there are some reports about the foot control going out of work after some time (could be replaced). The kit comes with 100 ink cups and an ink holder. These items are helpful when using the six colors of Iron Sakura base inks provided in the set. As well as, the two bottles of black ink also included. The ink in the kit is not hard black so you might want to test your colors to make sure you know what you are working with before it is already on someone. Eventually, addition ink for tattoos would need to be purchased. The E-onsale Deluxe Tattoo Kit comes with many accessories. You will receive disposable tips and needles, tools, cushion rings and rubber bands. All of this plus printer transfer oil, ointment, and practice leather like sheets make this set well rounded. Also, a tutoring CD that will provide you the first tips on how to tattoo included in the set. In conclusion, the E-onsale Deluxe Tattoo Kit comes at a great price for all the parts that are included. Be sure to research places to purchase more ink, because you will love this machine so much you will be buying ink very soon. 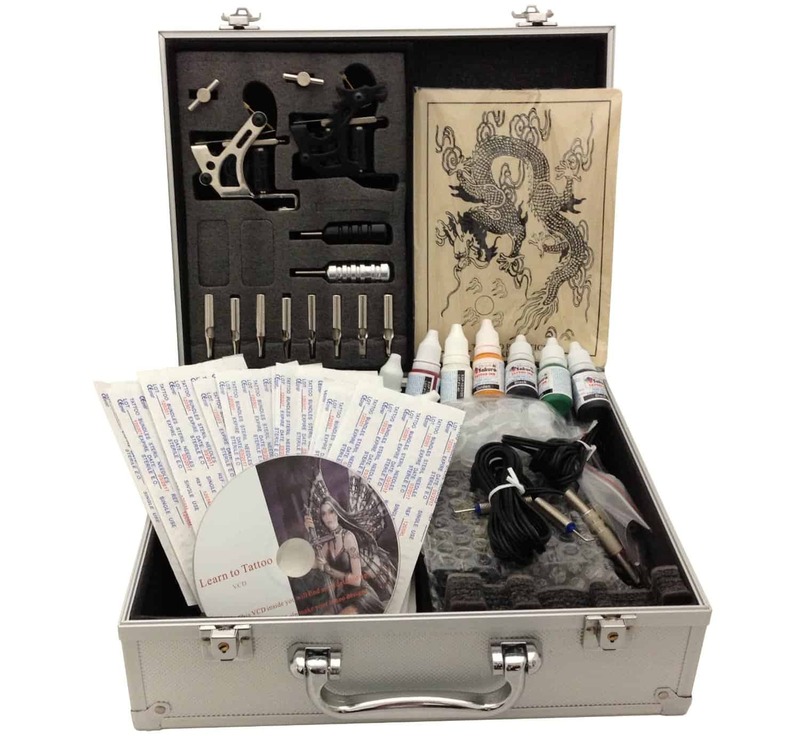 This kit is great for the experienced artists who want professional tattoo kits and the inexperienced that need suitable tattoo kits for beginners.